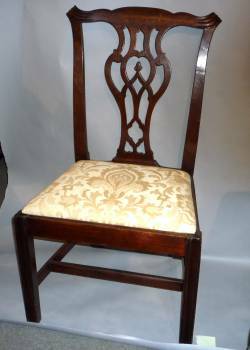 Pair Of Chippendale Period Side Chairs In Mahogany. One illustrated. Cupid's bow crestrail with moulded backswept ears. Splat carved with Gothic motifs: trefoils, quatrefoils & trifurcate finials above a Gothic arch & C-scrolls. Seat rail & legs moulded. H-stretcher.